Slum Online is a short novel about MMORPG gaming. I was skeptical of this concept at first, as I wondered how level grinding, ammunition collection, and/or interpersonal dialog along the lines of “omg n00b pwned” could be any less tedious in fiction than in real life (so to speak). Thankfully, the fictional game in question is a fighting game, and its setup and mechanics are both simple enough to be understood by a non-gamer and complex enough to not lose their freshness after two hundred pages. 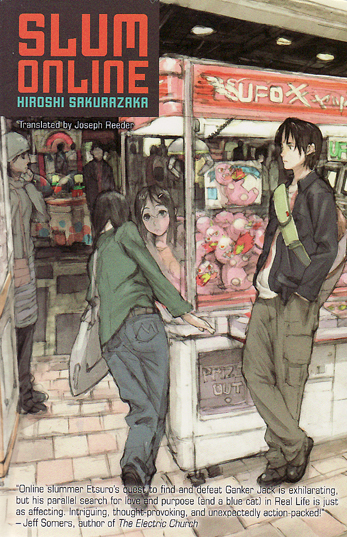 I was also worried that, since the novel’s cover (which is a mirror of the original Japanese cover) sports a manga-style illustration, Slum Online would be nothing more than a light novelized plot worthy of an anime (whose plots and dialog tend to not work so well without the animation). Again, my worries were unfounded, since the story more or less eschews anime tropes and works fairly well as fiction that can be read by someone not familiar with the quirkiness of characters like Suzumiya Haruhi and Lina Inverse. Slum Online follows an older teenager named Etsuro through his real and virtual life. In real life, he is a college student pursued by a classmate named Fumiko who is pursuing a blue cat through the streets of Shinjuku. In his virtual life, he is a karate fighter named Tetsuo who is pursuing a mysterious player known as Ganker Jack while being pursued by a ninja character named Hashimoto. The novel’s chapters alternate between Tetsuo’s real life and his virtual life, but there is little disconnect between the two; and, in the end, they come together quite nicely. It’s equally amusing for the reader to follow Etsuro through the backstreets and arcades of Shinjuku as it is to follow Tetsuo and Hashimoto through the alleyways and watering holes of the gaming world. Moreover, the cast of characters in either world is equally interesting, especially as they interact with each other across both worlds. I wouldn’t call Slum Online science fiction, necessarily, and it doesn’t quite belong in the realm of cyberpunk, either. I found it quite realistic in its depiction of gaming technologies, their applications, and the cultures that surround them. Nobody is downloading anything directly into their brains or raving about the awesome theoretical potential of cyberspace. The characters go to school and go to work like anyone else, and the only men in black suits are the salary men on the commuter trains. Everyone knows what Google and Wikipedia and Playstation are. I personally found it refreshing to read a story about real kids playing video games. No one is a hacker, and there aren’t any cyber police; it’s just a kid and his game console and his online network. There’s no nonsense in the book about not being able to tell the difference between the real world and the cyber world either, although Etsuro’s language occasionally betrays how his awareness of the real world is influenced by gaming. He describes hearing things in terms of “sound FX” and perceiving people’s faces in terms of polygons or anime-inspired designs. As he walks around Shinjuku, he remarks how convenient it is to not have to worry about running into invisible walls, and how in real life one can’t just approach someone and start a conversation as if he or she were an NPC. Despite (or more likely because of) his mild geekiness, Etsuro is an amusing and sympathetic narrator. Slum Online should be a fun read for gamers, and I think it should even be a fun read for non-gamers, who won’t be alienated by any specialist vocabulary. The translation is smooth and readable, the narrative flows quickly and seamlessly, and the layout is professional and engaging. The only bad thing I might have to say about this book is that it tends to come off as male-dominated, but whatever – I enjoyed it anyway.